HVAC Services Lawton: How Can An HVAC Specialist Help You? How Can An HVAC Specialist Help You? HVAC is crucial to invest in if you want to create a comfortable and safe indoor atmosphere for your home or office. However, if you want to get started installing or repairing HVAC systems in your home, you should first know a thing or two about what an HVAC specialist can do for you. In this blog, we’ll talk about what HVAC is and why it’s important to everyone. HVAC stands for heating, ventilating, and air conditioning. What does an HVAC specialist do? HVAC specialists install, repair, and maintain HVAC systems in your home or business. A specialist will travel to your site and look at blueprints or other design documents, then examine your home to determine your need for a new heating, ac, or ventilation system. They can also maintain, replace, or repair HVAC systems that are outdated or need replacement parts. Heating and air conditioning: These systems regulate the temperature, humidity, and general air quality in your home or business. Most HVAC specialists will be trained in everything, but some will specialize in certain HVAC systems such as solar panels, refrigeration, or water-based heating. 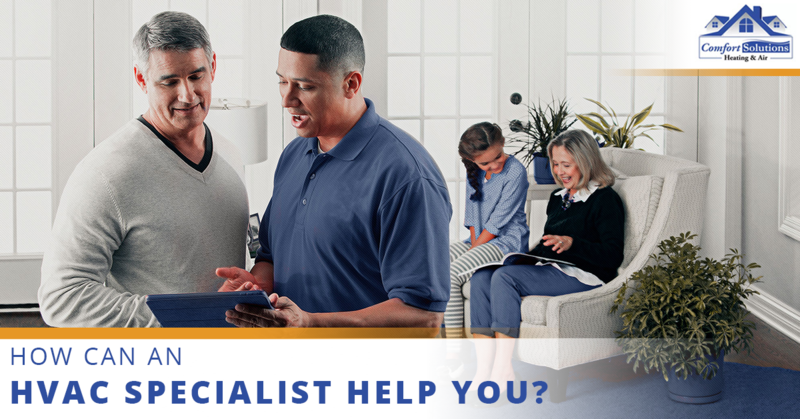 Make sure to talk to your HVAC specialist to find out what they’re best at. Ventilation: VOCs, or volatile organic compounds, are a variety of chemicals that can have negative short- and long-term health effects. These chemicals are typically found in a large variety of household products like cleaning products, paint, varnish, and wax. Due to the contained atmosphere, an indoor environment is more likely to have a higher concentration of VOCs. As a result, you’ll need a proper ventilation system that will regulate your air quality. When you hire an HVAC specialist, they will test your air quality to determine if it is safe. If not, they will take the steps necessary to eliminate the unsafe air and put a system in place that will continuously regulate your air quality. Installing and maintaining a proper ventilation system in your home is one of the essential ways to create a safe living environment for your family. According to the EPA (Environmental Protection Agency), long-term effects of indoor pollutants include respiratory diseases, heart disease, and cancer. However, the effects of indoor air pollution will depend entirely on the situation and the pollutants that are present. Humidity control can also prevent mold and other bacteria from forming in your home. Although the majority of cases aren’t this severe, it’s important to know the effects if left unchecked. Depending on where you live, either heating or ac systems will be more important. If it’s summertime and you live in a naturally hot environment, you’ll want to ensure you have a proper ac and refrigeration system in place. If you’re in a cold environment, you’ll want proper heating. In general, heating and ac are more for your comfort, but in extreme cases, people have experienced heat strokes in their own homes due to a poor ac system or one that needed repairs. Hiring someone who is a specialized in HVAC systems and has the proper certifications is important to ensure the job is done correctly the first time, so you have nothing to worry about! Are you looking for HVAC installation or maintenance in Lawton? Our team of experts is always here to help you with your HVAC needs. We are Nate, BCI, and NCI certified so you’re guaranteed to get the best service or your money back! If you’d like to learn more about HVAC maintenance, visit our blog. If you want to get started, contact a professional today for a free consultation!